Pressure-Flow® Cookers Are Changing the Way Dry Beans and Rice Are Being Processed in the United States! It’s a Game Changer. Visit Us and See It Run! The Pressure-Flow® machine was specifically designed to hydrate, par-cook or fully cook dry beans, grains and other particulates, offering processors a continuous first-in/first-out pressure cooker. 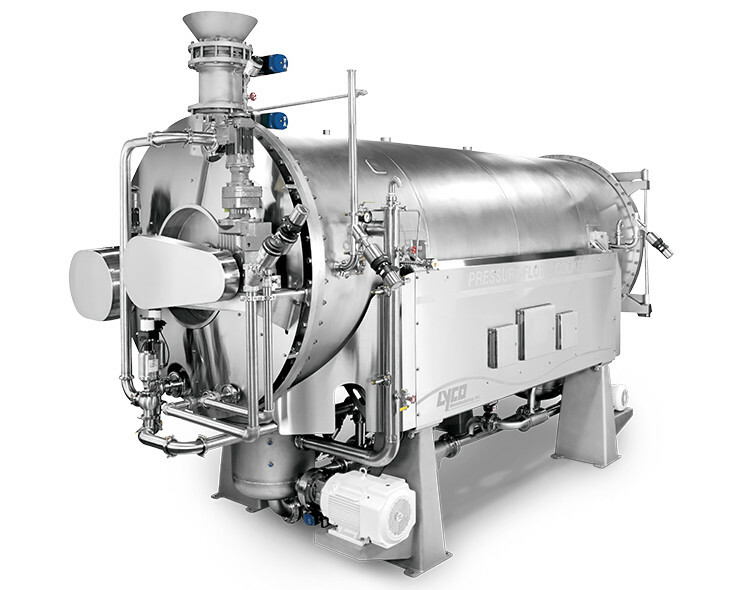 Product is continuously fed through a valve arrangement that allows product to enter the pressurized vessel while maintaining pressure in the cooker. Processing under pressure achieves temperatures up to 250°F which can cook many products like dry beans or rice in under 10 minutes. Product moves through the machine on a first-in/first out way submerged in water and suspended in motion by Lyco’s patented Hydro-Flow® technology which gently exposes each particle of food to the same treatment. Another patented system is Clean-Flow® technology which improves recovery and reduces damage. It also speeds up the cleaning process by cleaning everything in the machine at one time. Product exits the pressurized chamber through another valve system. The process time, temperature, water level, along with all other process conditions, are controlled by a PLC process management system.